When they checked out of their penthouse Tuesday morning, the elevator stopped one level below on the fourth floor. A woman got on who was hyperventilating and clearly distressed. The couple looked down at their feet, not wanting to intrude on someone’s personal business. But the woman started saying “oh my God,” over and over. The couple then asked if everything was OK. Her 16-year-old daughter had fallen from the balcony. As of Thursday, according to a post from the girl’s mother on the public “Montrose Message Board” Facebook group, the teen was in a coma in a Denver hospital. The girl suffered extensive broken bones and other injuries, and had undergone surgery that stopped her internal bleeding. The mother’s post said that the initial outlook was grave. 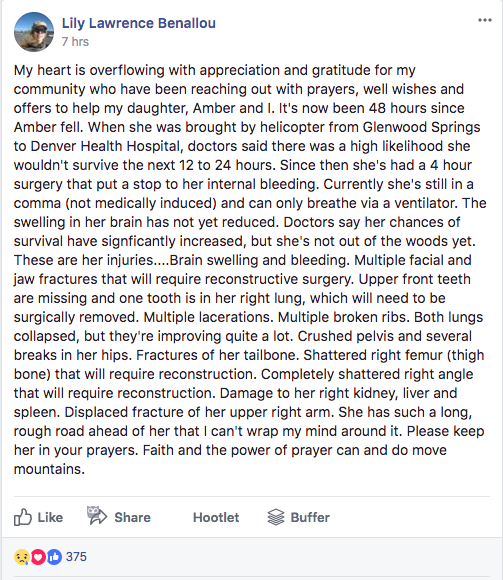 “Doctors say her chances of survival have significantly increased, but she’s not out of the woods yet,” wrote the mother, who said in an earlier post they were in Glenwood for a fall color getaway. Murphy was an Army combat medic for 10 years. “I was actually scared to death,” Murphy said in an interview Thursday. But he sprung into action. He ran out of the hotel to the girl. Murphy said she had fallen from the fourth-floor balcony that faces Sixth Street. She was face-down on the sidewalk down below. Murphy was amazed the girl was still breathing. He said she was likely going through agonal respiration, almost like her body was on auto-pilot. “I ran my hand softly down her back looking for any spinal injury and amazingly didn’t feel anything,” Murph said. When he checked her pupils, however, he said their differing size was a sign of bad head trauma. While Murphy was evaluating the girl, his wife was holding the mother. He said a manager of the hotel was out there trying to comfort the mother as well, along with bystanders who had gathered around. 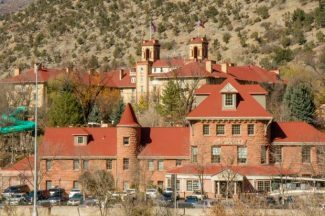 Glenwood Springs Fire Chief Gary Tillotson said the girl was then transferred to a hospital in Denver.